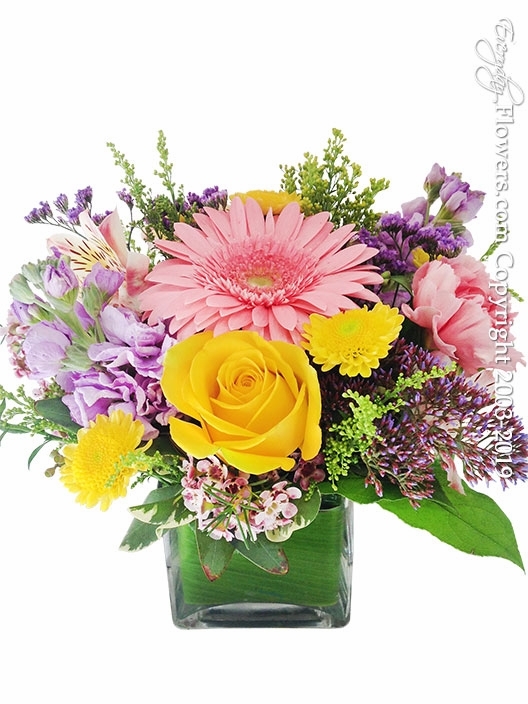 A cube glass vase filled with yellow roses pink gerbera daisies yellow chrysanthemum buttons lavender stock wax flower misty solidaster asltromeria and seafoam statice. Available for delivery in Orange County California by Everyday Flowers. This arrangement can be ordered and picked up at our location in the City of Santa Ana by calling ahead at 714-714-0306. Comes in a 4 inch glass vase and measures 9 inch tall X 9 inches wide.